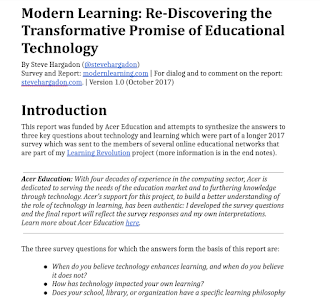 Steve Hargadon: Report - "Modern Learning: Re-Discovering the Transformative Promise of Educational Technology"
Report - "Modern Learning: Re-Discovering the Transformative Promise of Educational Technology"
Today I've released a report that was funded by Acer Education and which attempts to synthesize the answers to three key questions about technology and learning which were part of a longer 2017 survey which was sent to the members of several online educational networks that are part of my Learning Revolution project. When do you believe technology enhances learning, and when do you believe it does not? More than 450 responses were received (those that agreed for their answers to be shared publicly can be seen at modernlearning.com). This was not a scientific or statistically-rigorous process, but rather an attempt to find and highlight common-sense observations about the use of technology in teaching and learning. As such, I am hopeful that it might provide a springboard for those looking to clarify thinking, and to help guide organizations, in discussions and decisions about educational technology. My conclusion from the survey responses is not only that real benefits exist from ed tech, but that there is good evidence that they are, and can be, as transformative as we might hope. The report attempts to create a framework for highlighting where this is true and where it may not be, hopefully in a way that can facilitate open conversations by those at all levels of the education process (especially including parents and students). This task feels eminently urgent and important, because without such clarity, the potential for real change is significantly diminished, or may only be possible with some innovation that is so disruptive that it overturns the education system as we know it. Acer Education: With four decades of experience in the computing sector, Acer is dedicated to serving the needs of the education market and to furthering knowledge through technology. Acer's support for this project, to build a better understanding of the role of technology in learning, has been authentic: I developed the survey questions and the final report reflects the survey responses and my own interpretations. Learn more about Acer Education here.